Purpose: The aim of this study is to investigate the 4-year incidence and progression of visual impairment (VI) and the associated risk factors for incident VI in a South Indian population with type 2 diabetes. Methods: A total of 634 participants with type 2 diabetes were found eligible after 4 years. Visual acuity (VA) was estimated using the modified Early Treatment Diabetic Retinopathy Study protocol. VA in the better eye was considered for the assessment of VI based on the World Health Organization criteria. Mild VI was defined as VA <20/40 but up to 20/60, moderate VI as VA <20/60 but up to 20/200, severe VI as VA <20/200 but up to 10/200, and blindness as VA worse than 10/200. Results: The 4-year incidence of any VI, mild VI, moderate VI, severe VI, and blindness was 21.7%, 18.3%, 3.4%, 0.0%, and 0.0%, respectively; of the 13 participants with VI at baseline, 12 (92%) showed worsening/progression of VI on follow-up. Multiple logistic regression showed that nuclear cataract of grades >4.0 (odds ratio [OR]: 2.612 [1.148–5.942], P = 0.022) and lower socioeconomic score (OR: 0.965 [95% confidence interval, (0.933-0.998)], P = 0.040) were associated with the risk of future incident VI. Refractive error (47%) and cataract (30%) were identified as the leading causes of incident VI at follow-up. Conclusions: VI seems to be a significant problem among diabetic participants in the South Indian population. Refractive error and cataract are the leading but treatable causes of incident VI in this population and would benefit from intervention. According to the World Health Organization (WHO), the total number of individuals with visual impairment (VI) worldwide was estimated to be 285 million in the year 2010; of whom, 39 million were reported to be blind. The report also suggested that blindness is a major health issue and is unequally distributed among the different WHO regions (including India). In spite of increased cataract surgery rates in the past two decades, the prevalence of blindness in South Asia is three times higher than that in Central Asia. It is apparent that less-developed countries are likely to have a greater burden of blindness and causes other than cataract may probably account for it. Diabetes with even mildly to moderately impaired sight has a negative impact on perceived quality of life and psychosocial functioning, giving rise to feelings of vulnerability, worries about the future, and loss of independence and mobility. We previously reported the prevalence of VI among participants with diabetes in urban India to be 4%. Previous report observed progression of cataract and diabetic retinopathy (DR) along with increased incidence of other potentially blinding conditions such as retinal vascular diseases, optic neuropathy, and glaucoma among participants with diabetes. However, there are no reports regarding incidence and progression of VI among participants with diabetes from India. We therefore examined the 4-year incidence and progression of VI and baseline risk factors for incident VI. The study was approved by the Institutional Review Board and informed consent was obtained from each participant. The research followed the tenets of the Helsinki Declaration. The study design and research methodology is described in detail elsewhere. The study area was the Chennai metropolis with a population of 4.3 million, distributed in 155 divisions of 10 zones. As a sample, 5999 participants from the general population aged >40 years were enumerated by multistage random sampling. [Figure 1] is a flowchart showing recruitment and follow-up of Sankara Nethralaya-Diabetic Retinopathy Epidemiology and Molecular Genetic Study (SN DREAMS I) cohort. The SN-DREAMS II is a follow-up study wherein participants of SN-DREAMS I were reexamined after 4 years. 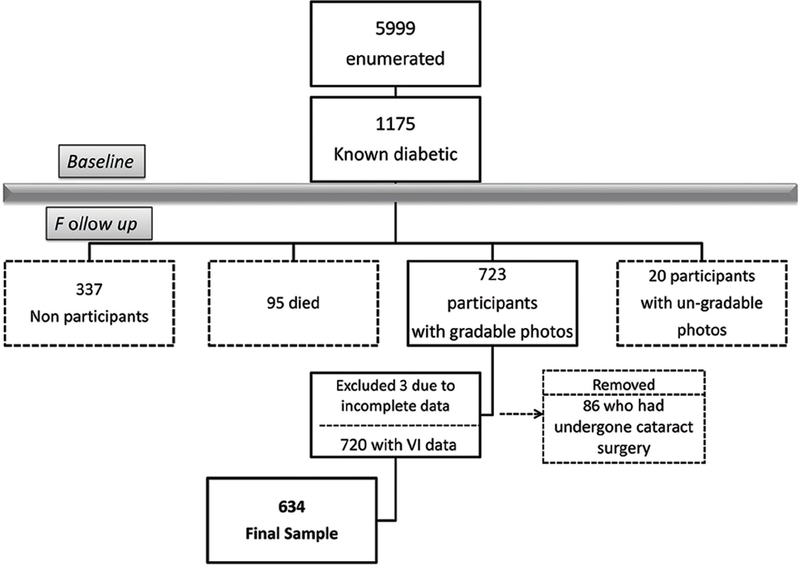 These 1175 participants who were previously known to have diabetes  were invited to the base hospital for a comprehensive evaluation, including assessment of visual acuity (VA), ophthalmic and biochemical investigations; 337 were nonparticipants, 20 participants had ungradable photographs, 95 participants had died [Figure 1], and 3 participants had incomplete data, with finally 720 participants available for the study. Of these, 86 pseudophakic participants were removed from the analysis; thus, a total of 634 participants were studied for the incidence of VI. VA was estimated using the modified Early Treatment Diabetic Retinopathy Study chart (Lighthouse Low Vision Products, New York, NY, USA). For those who could not read English alphabets, Landolt ring test was used. Objective refraction (Streak Retinoscope, Beta 200, Heine, Germany) was always followed by a subjective refraction. If the participant was unable to read the 4/40 (log MAR 1.0) line, vision was checked at 1 m, and if the participant was still unable to identify any of the larger optotypes, perception of hand movements was assessed; if the vision was less than hand movements, perception of light was tested. VA in the better eye was considered for the assessment of VI based on the WHO criteria. Mild VI was defined as VA <20/40 but up to 20/60, moderate VI as VA <20/60 but up to 20/200, severe VI as VA <20/200 but up to 10/200, and blindness as VA worse than 10/200. A range of demographic, biochemical, and ocular variables examined at baseline were assessed for risk factors for VI. Subsequently, the cause for VI was also examined. Refractive error was considered to be a cause for VI if there was improvement of VA by refractive correction. For other causes of VI, the best-corrected VA was considered. The cause for VI was separately documented by the ophthalmologist. In the presence of combination of findings, for instance, cataract, and age-related macular degeneration (AMD), the cause predominantly contributing to VI was specifically documented by the ophthalmologist. Ocular hypertension: Intraocular pressure >21 mmHg. Lens opacities were graded using the Lens Opacities Classification System III (LOCS chart III, Leo T. Chylack, Harvard Medical School, Boston, MA, USA). The fundi were photographed using 45° four-field stereoscopic digital photography and were graded by two independent masked ophthalmologists; the grading agreement was high (κ = 0.83). DR was diagnosed based on the modified Klein classification. To determine the incidence of VI, participants with normal VA  at baseline were examined after 4 years. To determine the progression of VI, participants with VI at baseline were examined for worsening of VI at follow-up. Statistical analyses were performed using the statistical software (SPSS for Windows, version 14.0, SPSS Inc., Chicago, IL, USA). Incidence of mild VI, severe VI, and blindness was assessed. Progression from mild VI to severe VI, from mild VI to blindness, and from severe VI to blindness was determined. Univariate and multiple logistic regression analyses were performed using incident VI as the dependent variable. P < 0.05 was considered statistically significant. [Table 1] presents the VA status at baseline and at follow-up. The mean age of the participants was 55 ± 9 years (range: 40–83 years). Of 634 participants with diabetes at follow-up, 620 had normal vision at baseline and were therefore considered as the number at risk for incident VI. Of the 634 participants, 135 (21.7%) developed some form of VI after 4 years; 18.3% of participants developed mild VI, 3.4% developed moderate VI, and none developed severe VI or blindness. [Table 2] presents the participants who showed incidence and progression of VI, where N represents those at risk at baseline. For instance, N at risk for incident VI represents those who had normal vision at baseline examination. N at risk for progression represents those who had some form of VI at baseline and are at risk of worsening of VI. Fifteen participants had some form of VI at baseline (at baseline, 2 had blindness, 12 had mild VI, and 1 had severe VI). The two participants at baseline who had blindness (VA <3/60) were not counted for progression as there is no progression beyond blindness. 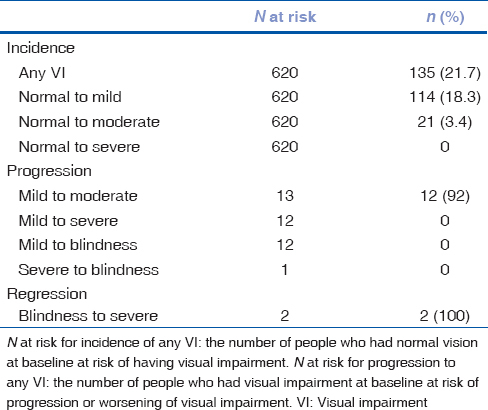 Therefore, excluding the two participants who had blindness (VA <3/60) at baseline, thirteen participants with VI at baseline were considered as the number at risk for progression; 12 (92%) of the 13 participants showed progression from mild VI to moderate VI (n = 12, 14.2%), whereas 1 participant with severe VI at baseline showed no change in the VI status (stable) on follow-up. 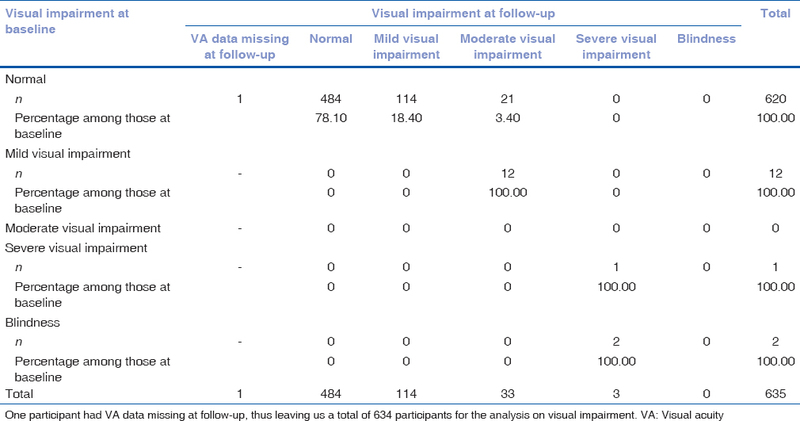 The two participants with blindness (VA <3/60) showed improvement to severe VI on follow-up. [Table 3] presents the baseline risk factors in participants with and without incident VI, using univariate analysis. The incidence of VI was significantly lower among participants with higher SESs than those with lower SESs (odds ratio [OR] = 0.959 [95% confidence interval [CI], 0.929–0.989], P = 0.008). 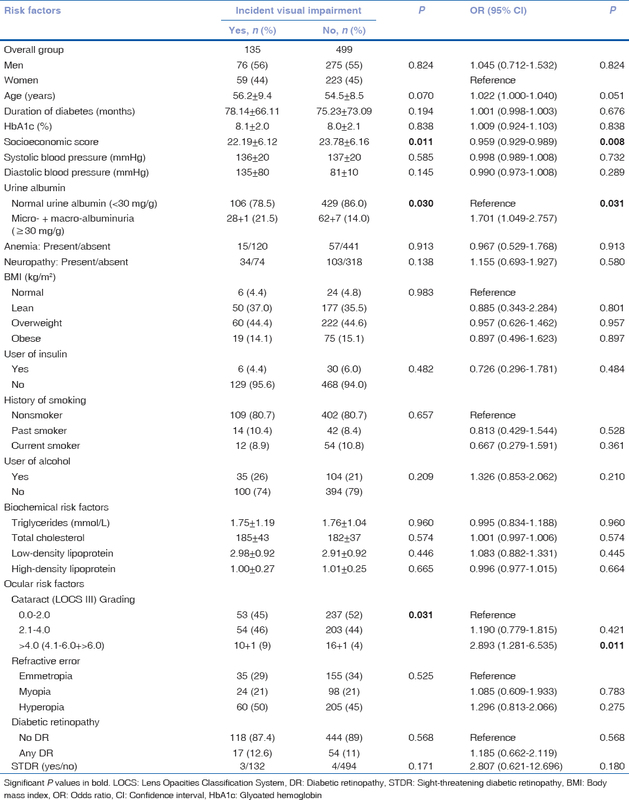 Those with abnormal urine albumin levels (≥30 mg/g) were associated with a greater risk for incident VI than those with normal urine albumin levels (<30 mg/g) (OR = 1.701 [95% CI, 1.049–2.757], P = 0.031). In addition, those with LOCS grades > 4.0 had a greater risk of developing VI (OR = 2.893 [95% CI, 1.281–6.535], P = 0.011). [Table 4] presents the risk factors for incident VI using multiple logistic regression analysis. After adjusting for albuminuria status, cataract graded as LOCS >4.0 (P = 0.022) and lower SES (P = 0.040) were the only variables identified as independent predictors of incident VI. Those with nuclear cataract of grades >4.0 had more than 2.5 times (95% CI, 1.148–5.942) the risk of developing incident VI in comparison to those with cataract grades in the range of 0–2.0. Those with lower SESs had 0.965 times (95% CI, 0.933-0.998) the risk of developing incident VI than those with higher SESs. [Figure 2] shows the various causes of VI; 47% and 30% of the incident VI were attributed to refractive error and cataract, respectively. The main finding of our study is that the 4-year incidence of VI in a South Indian population with diabetes is 21.7%, whereby majority (18.3%) of it is mild VI (VA <20/40–20/60) and about 3.4% had developed moderate VI (VA <20/60 but up to 20/200). [Table 5] presents a summary of the incident VI in diabetes reported in various studies across the world. Although the table summarizes all studies, only those with similar study duration may be comparable to our study. Klein et al. reported the incidence of VI to be 4.6%, 4.9%, and 3.7% at 4, 5, and 6 years of follow-up, respectively. Moss et al. reported a 4-year incidence of blindness to be 1.5% in the younger onset, 3.2% in older-onset taking insulin, and 2.7% in older-onset not on insulin. de Fine Olivarius et al. reported 6-year incidence of blindness to be 1.5% and incidence of moderate VI to be 6.2%. Compared with other studies, we observed a much higher incidence of VI although a majority had mild VI. In our study, cataract was a significant risk factor for incident VI similar to that of the studies by Resnikoff et al. and Klein et al. The 2002 National Health Interview Survey, United States, reported that 16% of those in the age group of 50–64 years with cataract had diabetes as against 6% in nondiabetic participants, and the percentage became higher (50%) in those 65 years or older when compared with 39% among nondiabetic participants. 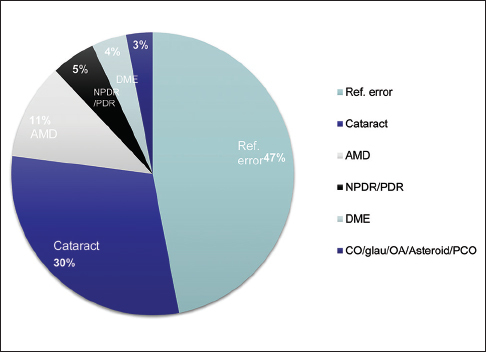 In our study, refractive error (47%) and cataract (30%) are the leading causes of incident VI [Figure 2]. Individuals with cataract at baseline examination were at a greater risk of developing VI than those with no cataract. Cataract is the most common cause of VI in Indian population. The Andhra Pradesh Eye Disease Survey  observed uncorrected refractive error (47%) and cataract (43%) as the leading causes of VI in a South Indian population. The Aravind Comprehensive Eye Survey  also reported cataract as the leading cause (72%) of blindness in a South Indian population. The aforementioned studies included study cohorts from general population and were not exclusively diabetic. Our study appears to be the first to report the incidence of VI in a South Indian population with diabetes. We observed AMD to be the third highest cause (accounting for 11%) of incident VI in the diabetic group; AMD was the leading cause of VI among Caucasian Americans whereas cataract and glaucoma were the leading causes of VI among African Americans. These findings are not surprising because the causes of VI can vary with race/ethnicity. Nevertheless, it is of concern that 11% of our study population had AMD. Studies conducted worldwide ,,,,, [Table 5] showed variations in their definitions of VI and also differed in the number of years of follow-up of the study populations, thus making direct comparisons difficult. We defined VI based on the WHO definition. The results reported here may therefore need to be interpreted in the given context and definitions. We observed that sight-threatening DR (STDR) is not a significant predictor of incident VI. Of the 135 participants with VI, only three had STDR. This probably indicates effective medical, laser, and surgical intervention practices in place or spontaneous resolution of DR without any intervention. The 4-year incidence of VI in a South Indian population with diabetes is 21.7%. Cataract and refractive error are the leading but treatable causes of incident VI in this population and would benefit from intervention. Jonas JB, George R, Asokan R, Flaxman SR, Keeffe J, Leasher J, et al. Prevalence and causes of vision loss in central and South Asia: 1990-2010. Br J Ophthalmol 2014;98:592-8. Rani PK, Raman R, Gella L, Kulothungan V, Sharma T. Prevalence of visual impairment and associated risk factors in subjects with type ii diabetes mellitus: Sankara Nethralaya Diabetic Retinopathy Epidemiology and Molecular Genetics Study (SN-DREAMS, Report 16). Middle East Afr J Ophthalmol 2012;19:129-34. Neena J, Rachel J, Praveen V, Murthy GV; Rapid Assessment of Avoidable Blindness India Study Group. Rapid assessment of avoidable blindness in India. PLoS One 2008;3:e2867. Oakes JM, Rossi PH. The measurement of SES in health research: Current practice and steps toward a new approach. Soc Sci Med 2003;56:769-84. Mohan V, Vijayaprabha R, Rema M, Premalatha G, Poongothai S, Deepa R, et al. Clinical profile of lean NIDDM in South India. Diabetes Res Clin Pract 1997;38:101-8. Molitch ME, DeFronzo RA, Franz MJ, Keane WF, Mogensen CE, Parving HH; American Diabetes Association. Diabetic nephropathy. Diabetes Care 2003;26 Suppl 1:S94-8. World Health Organization. Nutritional Anemias: Report of a WHO Scientific Group. Geneva: World Health Organization; 1968. Shaw JE, Gokal R, Hollis S, Boulton AJ. Does peripheral neuropathy invariably accompany nephropathy in type 1 diabetes mellitus? Diabetes Res Clin Pract 1998;39:55-61. Goldstein DE, Little RR, Lorenz RA, Malone JI, Nathan DM, Peterson CM; American Diabetes Association. Tests of glycemia in diabetes. Diabetes Care 2004;27 Suppl 1:S91-3. Klein R, Klein BE, Magli YL, Brothers RJ, Meuer SM, Moss SE, et al. An alternative method of grading diabetic retinopathy. Ophthalmology 1986;93:1183-7. Moss SE, Klein R, Klein BE. The incidence of vision loss in a diabetic population. Ophthalmology 1988;95:1340-8. Henricsson M, Tyrberg M, Heijl A, Janzon L. Incidence of blindness and visual impairment in diabetic patients participating in an ophthalmological control and screening programme. Acta Ophthalmol Scand 1996;74:533-8. Moss SE, Klein R, Klein BE. 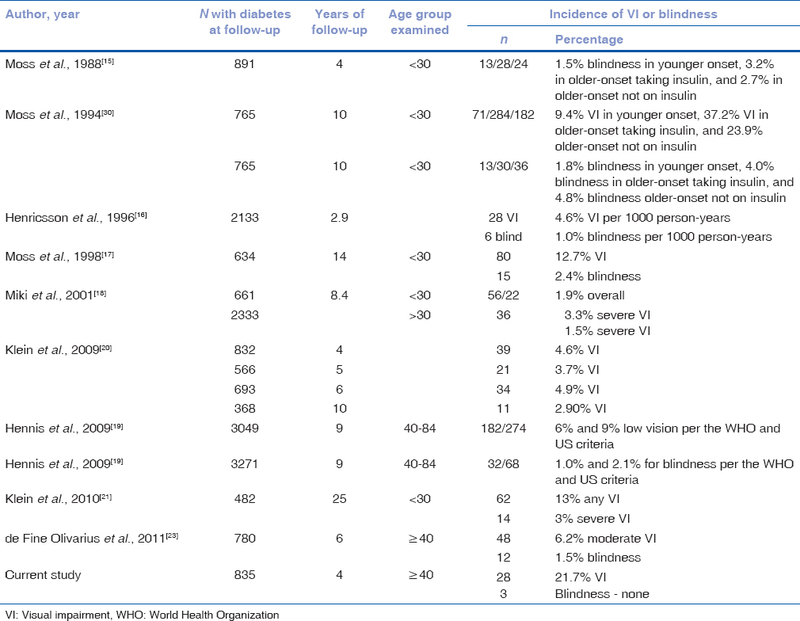 The 14-year incidence of visual loss in a diabetic population. Ophthalmology 1998;105:998-1003. Miki E, Lu M, Lee ET, Keen H, Bennett PH, Russell D. The incidence of visual impairment and its determinants in the WHO Multinational study of vascular disease in diabetes. Diabetologia 2001;44 Suppl 2:S31-6. Hennis AJ, Wu SY, Nemesure B, Hyman L, Schachat AP, Leske MC; Barbados Eye Studies Group. Nine-year incidence of visual impairment in the Barbados eye studies. Ophthalmology 2009;116:1461-8. Klein R, Lee KE, Knudtson MD, Gangnon RE, Klein BE. Changes in visual impairment prevalence by period of diagnosis of diabetes: The Wisconsin epidemiologic study of diabetic retinopathy. Ophthalmology 2009;116:1937-42. Klein R, Lee KE, Gangnon RE, Klein BE. The 25-year incidence of visual impairment in type 1 diabetes mellitus the Wisconsin epidemiologic study of diabetic retinopathy. Ophthalmology 2010;117:63-70. Raman R, Gupta A. Absence of diabetic retinopathy in a patient who has had diabetes mellitus for 69 years, and inadequate glycemic control: Case presentation: Response. Diabetol Metab Syndr 2010;2:20.
de Fine Olivarius N, Siersma V, Almind GJ, Nielsen NV. Prevalence and progression of visual impairment in patients newly diagnosed with clinical type 2 diabetes: A 6-year follow up study. BMC Public Health 2011;11:80. Rahmani B, Tielsch JM, Katz J, Gottsch J, Quigley H, Javitt J, et al. The cause-specific prevalence of visual impairment in an urban population. The Baltimore Eye Survey. Ophthalmology 1996;103:1721-6. Marmamula S, Narsaiah S, Shekhar K, Khanna RC, Rao GN. Visual impairment in the South Indian state of Andhra Pradesh: Andhra Pradesh – Rapid assessment of visual impairment (AP-RAVI) project. PLoS One 2013;8:e70120. Thulasiraj RD, Nirmalan PK, Ramakrishnan R, Krishnadas R, Manimekalai TK, Baburajan NP, et al. Blindness and vision impairment in a rural South Indian population: The Aravind comprehensive eye survey. Ophthalmology 2003;110:1491-8. Congdon N, O'Colmain B, Klaver CC, Klein R, Muñoz B, Friedman DS, et al. Causes and prevalence of visual impairment among adults in the United States. Arch Ophthalmol 2004;122:477-85. Moss SE, Klein R, Klein BE. Ten-year incidence of visual loss in a diabetic population. Ophthalmology 1994;101:1061-70.